Finally, you might say, but I have updated the sql database of test results. It is much the same as it was, but has a number of indexes and duplicate columns, to improve search speeds. gamerating - which shows the calculation for each game. rating - which, for each team, shows the change to their rating on a certain date. Finally, because I put this online, there is now a search function to show ratings at any point in time. Further improvements will be forthcoming, but suggestions/requests are welcome. In an evenly matched series with two conservative captains it is unsurprising that the final test was a draw, but it was still disappointing that neither side wanted to risk failure on the final day. In like circumstances 50 years ago the tied test could equally have finished as a tame draw, if not for the enterprise shown by both sides. To be fair though, South Africa are less culpable, already deep into the tail, they still managed to accelerate their scoring late on the fourth day, without ever reaching a total they could declare at that wouldn't be considered generous. With eight of the wickets falling to spin, and only Paul Harris to turn to, South Africa could count themselves fortunate that Kallis had provided them with a platform from which to push for victory at all. A stalemate ensued on the final day, with India unwilling to hit Harris out of the attack - or at least spread his fields to keep the score progressing - and Harris unable to breach impeccable defences. The final result of the series was a fair reflection on the two sides, and reinforced both their respective claims to be rated number one, and their inherent weaknesses: India's lack of bowling depth and occasional (inexplicable) batting collapses; South Africa's dependence on Steyn for inspiration, and mediocre output from some of their side. India relinquish the number one spot, but will travel to England in their next tour needing only tight results to reclaim it. There is very little worth saying about the Sydney result. Australia played as a beaten opponent does, always aware that England would strike with the ball, or consolidate with the bat, even when the match position could be read as a position of strength - as 1/105 batting in the first innings, and 5/226 bowling to England were. For England to be in this position is remarkable, but no more than they deserve. It was a series in which everything went right for one side. England were favoured with injuries, losing only Broad, but had strength in depth and planned for it, while Australia played injured and old players, for whom a long series is difficult. The weather, the wettest summer on the east coast of Australia for decades, favoured the English players, but also reflect a greater technical ability to deal with conditions - a recurring problem for Australia, and one previously solved by having players play county cricket. The toss was rendered irrelevant by England's confidence that they could bowl first, successfully, and force a win from that position. By the finish, Australia were a rabble, partly because England made them so, and partly because by the time frailties had been recognised in the lineup, the opportunity to rebuild had passed. Back in July, the frustrations of a poor series against Pakistan led me to state that the hubris infecting the side could lead to a flogging, but for the first three tests Australia maintained an equilibrium more in keeping with my first test prediction that the series would be close, but Australia needed to win in Brisbane. Their ignominious collapse in the last two tests reflects a crisis only if the present denial of circumstances is allowed to persist. Several players, key players, are clearly too soft when attacked intelligently. Like the English team of 06/07, the Australian players seem incapable of thinking for themselves, and are too reliant on process. That can be changed, with the right personnel in the right positions, as England have proven. There are other structural problems with Australian cricket that need addressing, but that can wait. For now, the ratings now put Australia somewhere between an average side and a good one, and England somewhere between a good side and a great one. The tourists have a depth of bowling talent and youth to carry them forward for several years at least. If word out of county cricket is accurate, then longer than that still. More than any other side in world cricket they have a ruthlessness and belief that great sides need. Whether they can maintain that against tenacious, high-scoring opposition remains to be seen. A somewhat esoteric post but one fully in keeping with the start of the Australian Open next week. While watching Morgan bat at Adelaide two days ago it struck me that the sportsman his technique most reminded me of was not a cricketer, but Andre Agassi. Partly, this is the choke hold he has on the bat, and the wrist-work, giving the impression he is swinging something shorter and more pliable than a hunk of wood. But also it is the manner of manufacturing balls to hit, in a simlar manner to the tennis great. Agassi was, to me, always the most interesting of the pre-Federer baseline sluggers of the 1990s, because his shots allowed him to play a different game to those players. 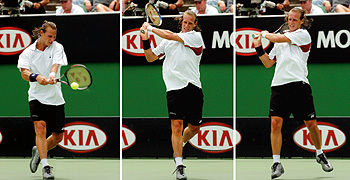 A classic two-handed tennis backhand, as discussed in relation to David Nalbandian sees a player step forward, taking the ball away from the body and pivoting on their front leg, to generate power through the hips. Andre Agassi did hit a classical backhand sometimes, as seen in the first shot in the video below, but less often. The weakness of hitting a backhand from wasit high is that deep balls push a player back behind the court, making it harder to generate angles (and therefore winners); in Agassi's case, being short, it also meant taking a lot of balls at or over shoulder height when a ball was hit shorter with heavy top-spin. What Agassi did, and therefore what made him amazing to watch was to take the ball from nearer his feet and drive it, such that his back foot stayed behind his front (see in particular the shots at the 1min mark). This allowed him to camp on the baseline, and dictate play; a court position that only Federer, for different reasons, maintains. Which brings me to Morgan, whose technique is generally described as unorthodox, but I think can be more accurately described as tennis-like. Morgan's stance is low, and he tends to get his front foot forward, swivelling, as in a classic backhand off the front foot to short balls when pulling or cutting. Worth noting too, that Morgan is a natural right-hander, and therefore hitting off playing backhanded. But nor does he play traditionally when driving. Whereas an orthodox player follows through over the shoulder, Morgan follows through as Agassi did on his backhand side, wide, with open hips and trailing back foot. The most important advantage of this approach is that, like Agassi, he can get underneath balls that land near his feet by keeping his arms straight, taking the ball from outside his body (and therefore off-stump) and hit with tremendous power with his weight behind the ball, but still retain control of the angle so as not to get too far underneath them. If the ball is bowled straighter he can clear his front leg and play the same shot, or play a more traditional clip off the pads with the elbow high. Whether bowlers can find ways to combat Morgan's stroke remains to be seen, but what can be stated is that unorthodox in this context is neither bad, nor uncontrolled. Just look at the player who won all four grand slams. A team is in real trouble when people start scrambling for the record books to see just how badly they are being beaten. Australia are hard to assess in that sense, having won in Perth and played respectably in India, there are reasonable grounds for supposing they aren't that bad. But the tendency to collapse, a feature of their cricket for the past three years means they are consistently trying to fight their way back into games, instead of having poor bowling performances meander to a draw. And yet, yet, oddly enough, had Australia had a little more backbone in Adelaide, the series would still be tied at 1-all. Moreover, they are still a reasonable, but unlikely, chance of tying this series at 2-all. Both a sign of how difficult it is to win in Australian conditions, and that some talent remains. We ought, therefore, to praise England for making Australia look so bad. Their tight bowling lines, mostly thoughtful field-placings, and intelligent batting (particularly on the first evening) has meant they are not only consistently putting Australia under pressure, they are inducing collapses, and then sticking the boot in with the bat. They go into this test with an opportunity to reach the top ranking spot for the first time since 1972. For Australia, another crushing loss will send them plummeting to their worst ranking since the early 1990s, with a feeling that there remains more to come. A final word on Ricky Ponting. For some time now I've wanted him to drop down the order or removed from the lineup, as his record has been below that required for a number three. After a test match so poor it threatens to besmirch both his playing and captaincy record, most commentators have joined the chorus of disapproval. It would be sad, therefore, if injury meant Melbourne was Ponting's last foray onto the test arena. Sad, but necessary however, as the side is going backwards rapidly with him at the helm. India would have faced up on the Durban pitch with some trepidation given their mauling a week earlier. 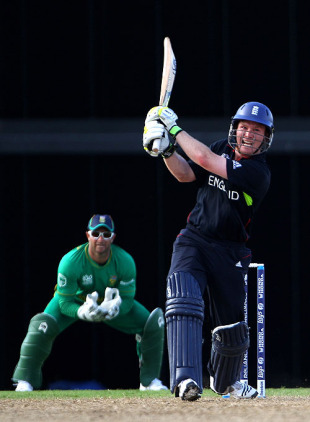 One of their great strengths as a team is that their batting strength largely protects them from losses. On a pitch that talks that strength is negated, and it becomes a test of mettle both for the batsmen (who must choose their shots judiciously) and the bowlers (who must bowl accurately to take full advantage). They owed the win in this test, as they have in several others this year, to Zaheer Khan and VVS Laxman, who assessed and played the conditions better than any player other than Steyn (a match-winner if not for his supporting batsmen). For South Africa, who have again failed to assert themselves on a home series, there remains the suspicion that they are carrying several players, and therefore too dependent on their stars performing, to maintain form. The series, and the race to be the number one is interestingly poised, although India now seem likely to retain that spot through the World Cup, before facing off against England in a head-to-head for same come June.